On Saturday August 25th Margriet will be presenting a full day workshop for the Mary Aiken sampler, including a PowerPoint presentation on the history of Rhode Island samplers. The PowerPoint presentation will be scheduled for 1 p.m. and all members are welcome even if they are not attending the class. A photo of the original sampler is below. Recreate a historic Rhode Island sampler, the earliest sampler known to include the specific bands found in later works from this region of the country. 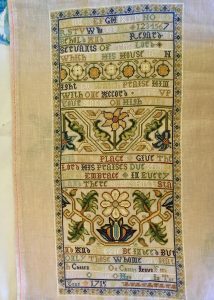 A young Mary Aiken stitched her design in 1715. Stitches in this unique reproduction include cross, reversible cross, Montenegrin, double running, cross over one, satin and long armed cross. 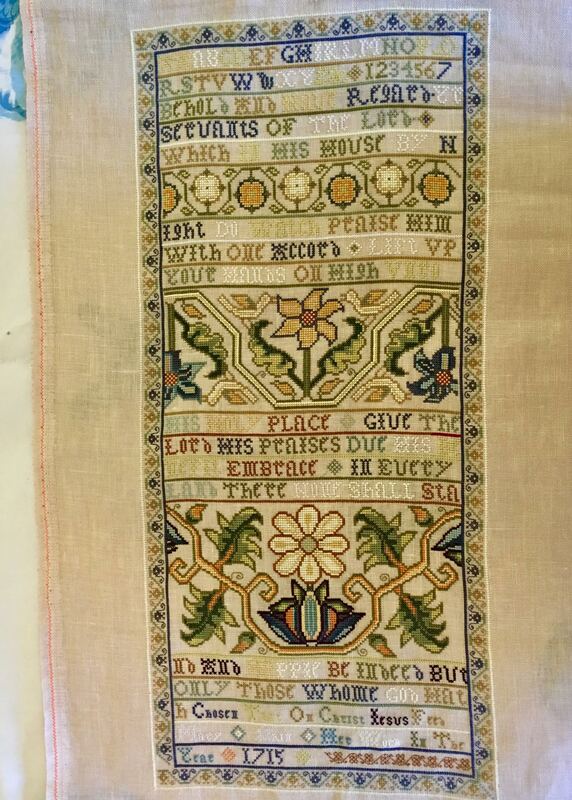 Worked on 35 ct. linen with AVAS silk thread the sampler 13 1/4″ x 19 1/4″. Meeting—June 10, 2018. The final cost will include the teaching fee which will be determined by the number attending. The remainder of the cost is due on the first day of the class and will be calculated based on the number attending but will not exceed the cost of the kits. Checks will be refunded if the class is canceled. A picture of the reproduction sampler is below.